Grant Langston came across my path by way of a jukebox sampler sent out by Sin City a few weeks back and I made a mental note to check into him further. Well the years and beers have taken tier toll and I plumb forgot about him until the good folks over at the Gobbler’s Knob posted their own fine review (http://www.thegobblersknob.com) and brought him back to my attention. So if you don’t like this review or the artist you can blame them….Ha! The Bakersfield is alive and well in the hands of Langston and like the the sounds forefathers – Buck Owens, Merle Haggard, Dwight Yoakam – Langston’s roots are in the South. Alabama is where he took up the trombone in his grammar school band, played piano as a teen and cultivated a distaste for Nashville brand of pop-country he heard on the radio. 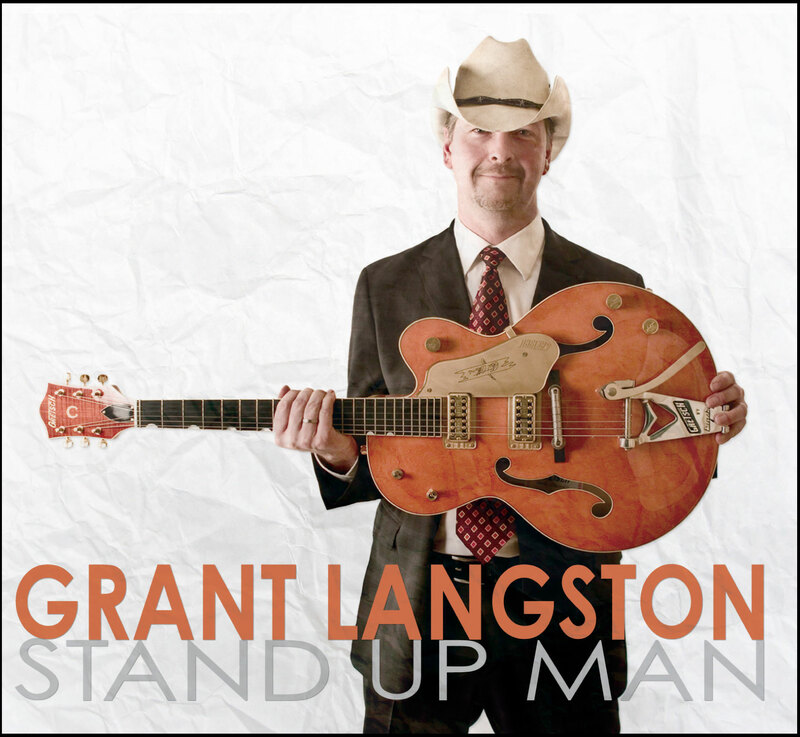 After making the trek out to the Golden State, where in now resides, Langston discovered Haggard, Yoakam as well as Johnny Cash, Willie Nelson and deeper well of country music to draw from. Stand Up Man proves he’s an astute disciple of the school of honky-tonk. Many of the elements of the lean Bakersfield sound was a result of the rise of rock and roll in the 50’s. Aside from a popping back-beat, the other most definable sound is that of red-hot telecaster licks. Lagnston is served well by Larry Marciano on guitar as well as dobro. the rest of his crack band The Supermodels is bassist Josh Fleeger and Tony Horkins on drums and percussion. You can almost smell the stale beer and hear the boots scoot across the wooden dance floor when the cooking title cut kicks off and you just know this is going to be a concert crowd favorite for years to come. The excellently titled Burt Reynolds Movie Brawl keeps the heat on and Shiner Bock and Vicodin is a brilliant addition to the long list of heartache resulting intoxicants documented in country music. The Texas shuffle Pretend You Love Me is bittersweet tale of communal denial and Not Another Song About California is a playful song about heading West that satisfyingly blurs the country and rock boundary. My favorite cut is Call Your Bluff. It slinks and shuffles along telling of a man fed up and showcasing Langton using a yodel/hiccup made famous by Yoakam. There is a Swamp Version of the same song that slows things down to a hot and humid pace and features a slow cry of Cajun s fiddle. It’s almost as good as the original. Stand Up Man is the kind of release that revives my faith that there are artists out there keeping the tradition and spirit of great country music alive and making it dance in the here and now. Pingback: TMR Music Review: Elvis Costello - Secret, Profane & Sugarcane : Give Me a Music Revolution!